This design needs a lot of help I thought, staring at a general contractor web design I created 10 years ago. It is not often that I have to critique myself, of course let’s remember 10 years ago I was brand new to web design and some of my designs may have been based off of what might work in a brochure rather than a more tactile web experience. First mistake I notice is white words on a brown background, – not very easy to read. I have to admit the design does have a nice clean feel but as I perused some of Birmingham’s amazing homes they built I felt the design needed to be more upscale. There is a large audience of affluent people moving into Westminster and Eldersburg, Md areas that want huge and beautiful homes. 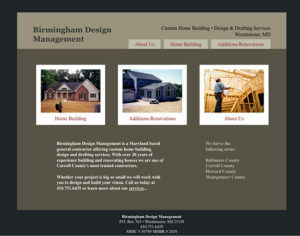 I wanted to make sure Birmingham Designs logo and their work matched their client’s expectations. 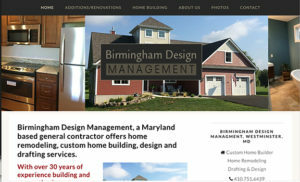 Other major improvements include making the site resize for mobile devices, SEO search engine optimization including labeling of photos from ex: “house” to “general contractor Carroll County, Md custom home”, adding more content to pages and a larger photo gallery to showcase all their work.